Ethan Hawke has perked up a bit lately. First it was Sinister, now this and very soon Before Midnight. Where’s he been hiding all this time? It’s nice to see him back. It will be nicer to see him back with Linklater. In the meantime, we have The Purge. 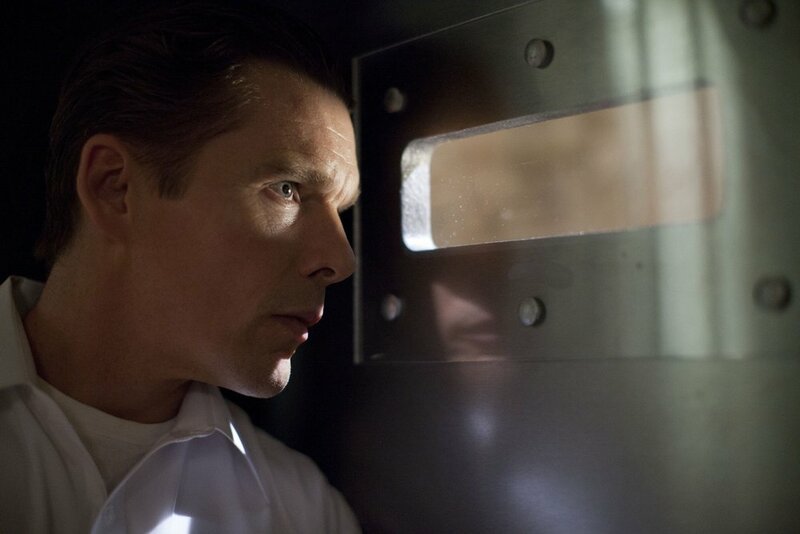 High on concept and low on detail, the premise of The Purge is simple. The good old USA has got sick of all the violence and come up with a solution. For 12 hours per year, anything goes. Emergency services are suspended and you’re allowed to do whatever the hell you like. The results of this are broadly twofold. One, unemployment is down to 1% and crime is virtually non-existent. And Two, the rich are now hiding out in super-secure enclaves, oblivious to the poor and homeless. Arguably, the latter is no stretch, the former however, takes a great deal of goodwill to swallow. The plot holes are gaping and for the sake of accepting the plot as read, I’ll gloss over them for now and concentrate on the story. Ethan and his good lady wife Lena Headey (herself enjoying something of a cinema run after the re-boot of Judge Dredd) are doing nicely out of The Purge, shacked up in a gigantic Mac-Mansion built off the back of Ethan’s successful security system sales. They have two kids, one a geeky type who hangs out in a wardrobe and drives a tank / baby / night-vision enhanced radio-controlled toy around the house, the other a stroppy teen who inexplicably doesn’t change out of her school uniform on getting home. Not being ones to take part in the bloodlust of The Purge, the Sandins tend to settle down behind their iron gates to sit out the carnage. Other crimes are allowed during The Purge but the film concentrates entirely on murder for some reason. Things don’t go well this year though and soon the happyish family are stuck with a homeless person, a dilemma and what appears to be a bunch of tooled up public school kids on the driveway, just desperate to off the homeless chap. It's possible that these guys are some slamming indictment of the Republicans in the States but there's a good chance that subtlety will be missed over here. Let’s hit the good first as I did greatly enjoy big parts of this film. The tension. This is built up really well, the build up to the siren that indicates the start of The Purge, the preparation, the character’s nervy acceptance of the situation, all add to an interesting atmosphere. This is assisted by some great sound work, everything is just slightly too loud, making you distinctly edgy. The idea itself has merit, making you wonder what you would do given free reign for a night with no law and no repercussions beyond living with yourself. The family is pretty believable and for the most part sympathetic, I didn’t spend a great deal of time wanting any of them in particular to be killed off. But. There is a pretty large but. I mentioned the goodwill required to swallow the initial idea at the start and the film just doesn’t do enough with the idea to buy this goodwill. Once the doors come down, we’re rapidly thrown into desperate gun battles and flashing torches leaving you to ponder the plot holes, not the least of which is why on earth did the public school kids not just wander off and top another drifter? Why go to all this trouble? At the start I was wondering what I would do given this freedom. By the end, I was shaking my head picking over the logistics. For one, given how wealthy the family are and how apparently disinterested they were in The Purge, why not just go away for the weekend? The sneaking religious fervor that’s attached to The Purge seems forced, late in the day and largely unnecessary - it negates the idea and just introduces another set of grinning bad guys. What of terrorism? Is The Purge limited to US citizens? Who's checking documentation? What happens if you stab somebody at 6.30am and they die at 7.01am after the deadline? So many pointless questions. And the final scene. I won’t describe it too much as that would contain spoilers but sufficed to say, in such a straight-faced film, it elicited much laughter that I cannot entirely believe was deliberate. It also pretty much unwittingly skewers the entire concept. I did enjoy a fair amount of this film, as I mentioned, the suspense is pretty much spot on in a lot of places and the 85 minute running time won’t give you a lot of time for reflection. I just wish they’d done more with an interesting idea. Check out The Purge tailer here.